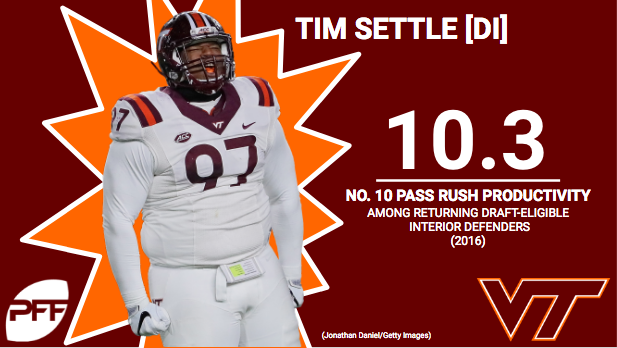 Coming off his first active season at the collegiate level, Virginia Tech defensive tackle Tim Settle took the ACC by storm despite playing within a limited role. Totaling 18 pressures on 131 pass-rush snaps, Settle ranked No. 10 among draft-eligible interior defenders in pass-rush productivity (10.3). A former five-star recruit, Settle excelled at applying quick interior pressure, as he ranked No. 10 among that same group of interior defenders in pass-rush productivity on dropbacks of 2.5 seconds or less. Settle also flashed some versatility in that he ranked No. 7 and No. 12 in pass-rush productivity from a two-point stance and three-point stance, respectively. Now entering his redshirt sophomore season, Settle will have to direct his focus over to the run game. He ranked No. 33 in the 2018 draft class in run stop percentage at 8.6 percent.